Yee Peng is tha annual festival held to celebrate the fulll moon in the northern capital of Chiang Mai on the day preceding Loy Krathong by one day in November.The word “Yee Peng” is the northern Thai term referring to the full moon of the 12 th lunar month in the Buddhist calendar. The festival is celebrated as a religious event in whichlocal people throughout the region make merit and other religious activities. The highlight of the event focuses on the lunching of the Khom loy or floating lanterns info the night sky with the belief that misfortune will fly away with the lanterns. It is their belief,if the lanterns are made and offered is said to symbolise knowledge and the light it gives will guide them to the right path of their lives. Meanwhile,”Khom loy” is a Thai word signifying the floating lantern which is a large balloon – like made from a light bamboo frame covered with saa(mulberry) paper. It floats by means of hot air heated by a flaming torch fixed in the balloon. During the event, both day and night local people and monks are closely involved with the Khom making process. Besides, the premises of large hotels, the temple compound is thus the appropriate venue for the launching of the Khom. 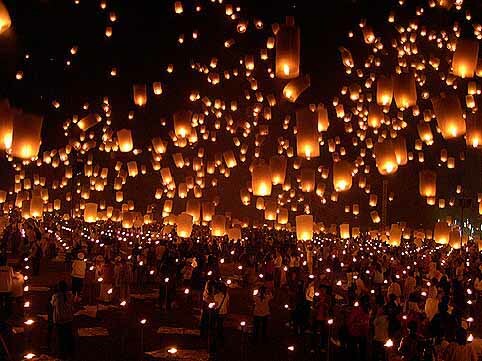 The activity has gained such popularity that at the height of the event the flight training of the Royal Thai Air Force has to be suspended until all the Khom Loy have dispersed while all commercial air traffic at the airport has been warned to exercise extreme caution as the climbing lanterns could pose a danger to the jet turbines. To celebrate the auspicious event, companies and private individuals make merit by sponsoring balloons to dispel bad luck and seek good fortune. If their balloons rise high and travel far, this indicates prosperity. It has been said that this kind of hot air balloon could rise to heights of up to 1,250 metres and travel even as far as Hat Yai District of the southern province of Songkhla. The most spectacular event is held at the Thapae Gate area where local and foreign visitors can see floats, marchers and beautiful Yee Peng queens. As the night falls, the spectators will be excited to see the long strings of Khom loy rise gently into the limitless sky as they stimulate the participants’ spirits to rise higher to the heaven. This brings joy and happiness to the merit-makers since their ill-fortune has been floated away. With permission form : Thanapol Chadchaidee. (1994). Essays on Thailand. Bangkok : Thaichareunkanpem.